Dancers need more than balance at the barre to be successful—they need it in life, too. That's where Jessica Spinner's online program The Whole Dancer comes in, making professional nutrition and wellness counseling available to dancers everywhere. “There's only so much your teachers can impart on you in the studio, and they're mostly focused on technique," Spinner says. “You need to have something outside to support you, as well." A former ballerina, Spinner started her training with Eglevsky Ballet School on Long Island before attending Butler University. Spinner's own battle with her body image began at 14, immediately following her first summer program. “I'd picked up some bad habits and I'd gained some weight," she remembers. 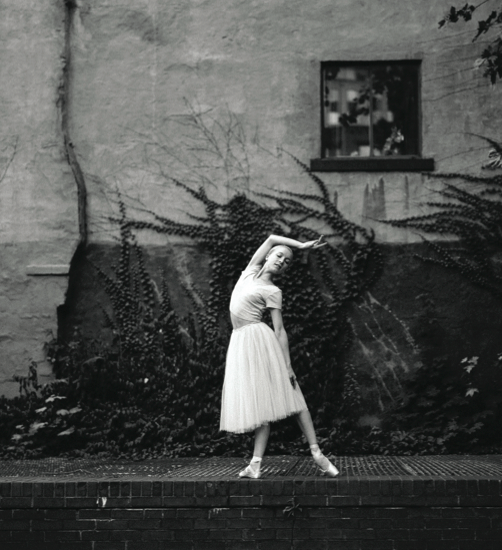 “I hadn't realized until I was sitting next to my ballet teacher outside the studio. She patted my thigh and said, 'That wasn't there before.' " So Spinner went on her first diet. Too embarrassed to even ask her mother for guidance, she did so alone and decided not to eat anything containing more than three grams of fat. “Clearly, it was a totally misguided idea and supremely unhealthy." Spinner danced professionally with Louisville Ballet, and then as a freelance dancer in Boston. But a fractured tibial sesamoid ended her dance career. “Trying to come back from that injury, I felt emotionally drained every day," Spinner remembers. “I was lacking a support system and felt totally lost and alone." It took Spinner years of odd jobs and schooling to figure out what her new passion could be—a process unfortunately familiar to many former dancers. As she transitioned from dance and began taking yoga and exercising outside, Spinner was able to stop worrying so much about being thin, and think more about being healthy. A new passion was born. She sought a program with a more holistic approach to wellness, and eventually decided to attend the Institute for Integrative Nutrition to become a wellness coach. on areas she found necessary to create a balanced life based on her experience—goal setting, healthy eating, cross-training, career, personal assessment, self-love and self-care. “In the program, mind-set is a big component throughout, and healthy eating is the focus of one full week," she says. “Knowing what to eat helps, but if you can't move past those negative comments that we as dancers hear, sometimes daily, you're not going to be able to build the balanced lifestyle that is necessary to drive a long and successful career." In August of 2015, Spinner launched The Whole Dancer with a free webinar focused on eating for energy and injury prevention. She began The Whole Dancer's first round of enrollment during the webinar. Today, the program is an eight-week online course that includes webinars, worksheets and live calls, with topics ranging from meal planning to self-care and goal setting. It's designed to teach dancers the skills they need to cope with dance-specific pressures. “Dancers learn how to do unbiased self-assessment and create challenging yet attainable goals," she says. “They get support from a community of dancers, as well as a mentor who's been through it." Participants also gain access to a private Facebook page for discussion with other dancers who are currently enrolled in the program or who have been enrolled in the past. “You begin to realize that you're not the only one feeling the stress—and that can help immensely," Spinner says. For Spinner, discovering a passion on the other side of a dance career has been immensely rewarding. “I'm reminded of what lovely people dancers are," she says. “We aren't always willing to admit our weaknesses to our fellow dancers, so offering a support system through The Whole Dancer is really just wonderful."